Malaysia is a blessed country with sunny weather whole year long and various interesting places to be explored. When being asked about the major attractions of Malaysia, most of the people will first thought about wonderful and stunning beaches. In fact, it is true. Pulau Tioman is undeniably one of the most prominent islands in Malaysia which impresses tourists from all around the world. Surrounded by the South China Sea, the gorgeous Pulau Tioman has won several accolades, such as “Paradise Island in the Tropics” and was once being rated as “The Most Fascinating Island in South China Sea” by many tourists. The most significant award is probably by Time Magazine where it is being selected as “The World’s Most Beautiful Island”. 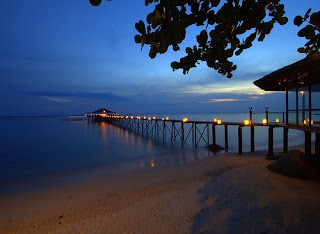 Located at southern Peninsular Malaysia, about 56 km off the coast of Pahang; Tioman Island is accessible through land transportation or plane and follow by boat. Visitors can choose to take the boat from Mersing jetty at Johor or Tanjung Gemok jetty at Pahang. It takes about 1 to 2 hours to reach the island, depending on the weather. A lot of beautiful places in the world have some sort of legend and myths, which make the particular place more interesting. Tioman Island is no exception. According to legend, this island is a place where a beautiful dragon princess rested while she was on her way to look for her lover. However, this beautiful island has truly attracted her and thus, she changed her initial plan of looking for her lover and decided to stay there forever and ever instead. Doesn’t this myth make this island more mesmerizing? 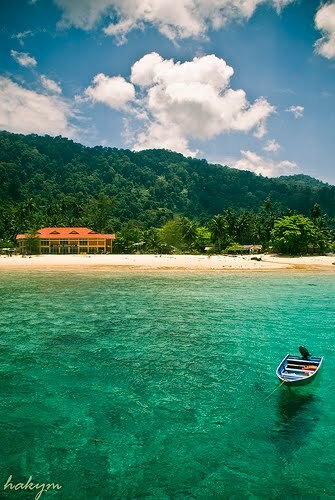 Whether or not a beautiful princess rested on the island, Pulau Tioman is surely one of the most beautiful islands in Malaysia. Surrounded by many other smaller islands such as Renggis Island and Charming Island (which are good places for scuba diving), one can have so many interesting activities to fill their time with. Marine Park which is located at Tanjung Merah is a must-go place when you go to Pulau Tioman. The famous Marine Park is a special area of the sea which serves as a “protective zone” for the coral reef community. You can go snorkeling, swimming with housands of beautiful fishes in a proximate manner and be amazed by the eye-catching and colourful coral. Apart from snorkeling, underwater photography service is also available. Capture yourself swimming with fishes around you in the sapphire blue water is the best memory one can brings back from Pulau Tioman. 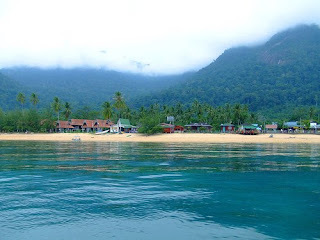 Besides, Pulau Tioman also provides adventurous activities for visitors who are looking for something different. You can opt to go for a jungle trekking in the natural tropical rain forest. Apart from fresh air, you will get to see a lot of precious flora and fauna. 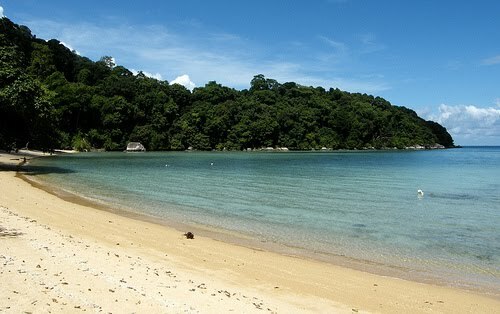 Monkey Bay which located at Salang and ABC Village is one of the beaches that you can reach through jungle trekking. You can also explore different beaches in Pulau Tioman by riding a speed boat, jungle trekking is another good alterative. If jungle trekking is not exciting enough, you can choose to go for rock climbing. The granite formation at Gunung Nenek Semukut or Dragons Horns has made them a perfect place for rock climbing. Those who are interested in jungle trekking and rock climbing are advised to get local people to make arrangement. 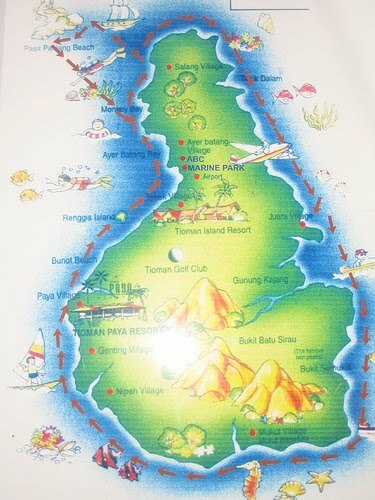 In addition, there are a lot more activities that can be done in Pulau Tioman apart from those mentioned earlier. Exciting water activities such as boating, water skiing and wind surfing are available upon request in different beaches. There is a wide range of accommodation available - from low-cost resort to 5-star luxury hotel in the island. No matter what are the reasons that drive you to pay a visit to Pulau Tioman, you will always get more than what you have expected. In this paradise, even taking a nap under the sun and listening to sound of waves by the sandy beach are the best ways to escape from the bustling city life.